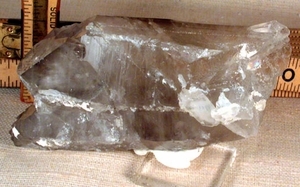 Over half a pound, 1x 2x 4 3/8" tall, here is a rare Arkansas smoky - with natural damage - of two curved tabular crystals with three main terminations and the following: 1-Natural, self-healing fracture [with white clay] across one side of the main crystal and three sides of the other twin. 2-Elestiallated prism sides with white clay, drusy, glitter, barnacles, and growth marks. 3-Rare irises and rainbows. One iris shows at the fracture base [the other twin's base is in regrowth]. 4-The taller twin has a multi-terminated, castlellated top. The other, with two faces covered in swirls, a conchoidal [new] area with a large record keeper. Wonderful variations in color, layering, translucency and veilings. Wonderfully powerful, too.